North Country Nutrition & Wellness is updated and maintained by the Registered Dietitian at Littleton Regional Healthcare. 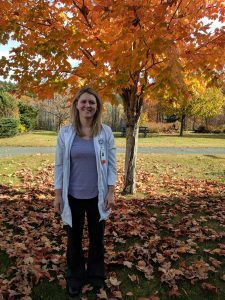 Ashley Wentworth, MS, RD, LD has been with LRH since 2010 after completing her training through the University of Vermont. Ashley helps to coordinate care for patients at the hospital and provides Medical Nutrition Therapy to outpatients referred by their primary care provider. Only a Registered Dietitian (RD) has completed education and training established by the Accreditation Council for Education in Nutrition and Dietetics (ACEND). Registered Dietitians are required to hold a bachelor’s degree, they must complete a specially designed, accredited nutrition curriculum, complete an extensive supervised practice program, and pass a rigorous registration exam. Registered Dietitians are the food and nutrition experts and can provide the highest level of nutrition counseling. A Registered Dietitian provides individualized care and advice. A Registered Dietitian learns about your habits and history and then helps you create personalized goals and plans. Do not expect a one-size-fits-all approach from a Registered Dietitian. Chronic disease management for diabetes, high blood pressure, cancer, high cholesterol, and more. Weight management. Registered Dietitians can help you manage your weight safely, effectively, and can give you long-term results, unlike fad diets. Food allergies, intolerances, or sensitivities. Interested in coming in for an appointment with our Registered Dietitian? Please get in touch with your primary care provider to complete a referral.